Emily Trask as Viola In Folger Theatre’s Twelfth Night. Photo: Scott Suchman. Call them what you will, in our production of What You Will – of the Twelfth Night variety – most of us are sporting them. Including me. I have the privilege and challenge of taking on one of Shakespeare’s most famous “pants roles” — Viola. For those of you who might not know, Twelfth Night more or less begins when Viola gets shipwrecked on the shore of a strange country. She has been separated from her twin brother and fears him dead. This being the case, she has no remaining family and no status on the strange isle of Illyria. It is unsafe for a woman (at that time) to travel alone, and as Viola is not ready (neither emotionally or legally) to deal with the ramifications of being the sole proprietor of her own “estate,” she openly wishes she “might not be delivered to the world, till I had made mine own occasion mellow, what my estate is” (Twelfth Night I, 2). A wish that she manages to achieve when she comes up with the clever plan of disguising herself as a boy until such a time comes that she feels safe enough to reveal her gender. This device is a familiar one to Shakespeare and his audience. In Two Gentlemen of Verona, Julia steps into a pair of trousers to follow her Proteus while he visits his friend abroad – only to find out, while in her masculine trappings, her beloved is duplicitous. Of course Portia buttons up the suit of a lawyer to represent her new husband’s best friend in legal proceedings leveled against him by Shylock – and then doubles down on her disguise and proceeds into a further trial, this one testing Bassanio’s love by requesting his wedding band for payment of her legal services. In A Winter’s Tale, Pertida gets decked out in drawers to travel with Florizel and is eventually reunited with her true father and mother. And there are even more women wearing pants in the Shakespeare canon! 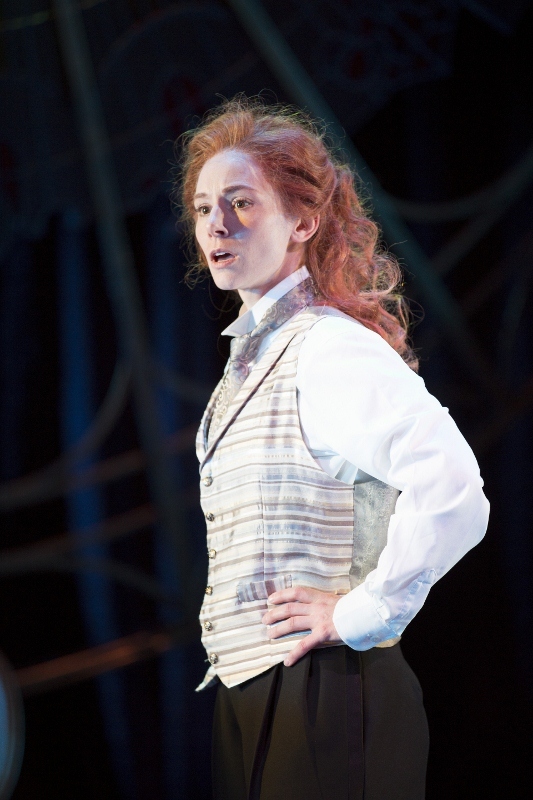 Emily Trask as Viola in Twelfth Night. Photo: Scott Suchman. In almost all of these examples, pants (a.k.a. the male attire) serves as a disguise of safety for the females who wear them — a shield and a mask donned for protection and obscurity. However, so often, it is in the confines of this very disguise that these women are interestingly empowered, freed to give expression to a secret part of themselves. In pants “she” can leave the constraints of female propriety behind and woo in her own words, be the pursuer instead of the pursued, argue equally, “speak masterly,” live bravely, and explore the various forests of Shakespeare’s invention, as well as those shadowy woods of the human spirit. Indeed, tucked into the confines of a masculine disguise presents an amazing opportunity for these female characters which was, in many ways, quite prophetic. There is, of course, an ironic twist at play. After all, we’re talking the Bard here. When Shakespeare was writing his plays, he was writing for a company of men. It was illegal for women to be on stage. So all this prophetic empowering, amusing, and illuminating “cross-dressing” of a woman in pants was, in its time, actually a young male actor returning to his rightful jodhpurs when the female character he was playing was in disguise. This was, as one might imagine, to excellent comic effect. And one can assume it was certainly easier to pass off a young man in, well, the disguise of a young man (says the female who nightly sticks on a mustache with toupee tape and a prayer). 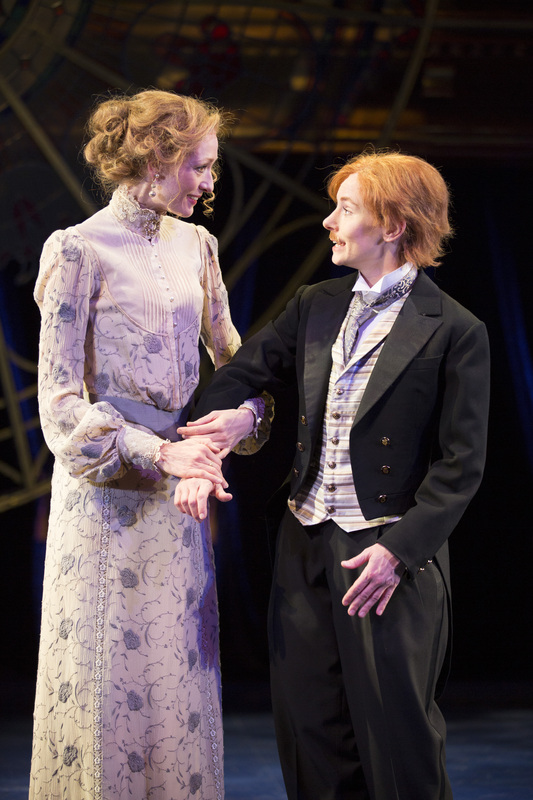 Olivia (Rachel Pickup, left) believes Viola (Emily Trask) to be the young man Cesario. Photo by Scott Suchman. Nevertheless, this idea that Shakespeare set into motion with his “pants roles” was, in fact, predictive if not prophetic. If we proceed further down the socio-political and theatrical road a few hundred years, we see the shoe is on the other foot – or in this case, the pants are on the other leg? After the Restoration in 1660 (mere decades after Shakespeare wrote his plays), Charles II decreed that women would be allowed on the English stage, and less than 200 years later life began to imitate art. Women. Started. Wearing. Pants. Some for practical reasons, some for political, some to better make their way into the proverbial forest of society. In the middle of the 19th century, the abolitionist movement had led women to believe that all members of society should be treated equal. And surely, if equal could be applied to race, it should be applied to gender as well. Therefore, early feminists and members of the women’s suffrage movement began pursuing remedies for the social and legal restrictions that limited a woman’s ability to live a full and diverse life. One example of such a legal restriction that would have to be overcome was the 1849 Tennessee Legislature’s ruling that women could not own property because they did not have souls. (Hmmm.) Obviously some of such restrictions and limitations on the lives of women were legislated (by men), but other restrictions presented themselves in women’s lives in a very physical way. Namely: clothing. 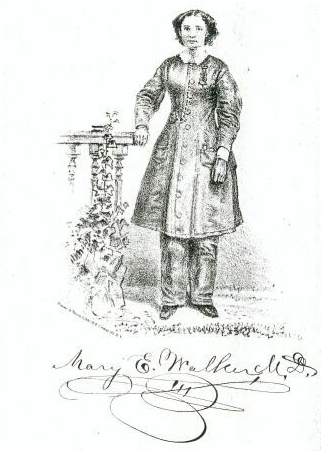 “The ‘Bloomer’ or ‘Reform costume’ was meant to liberate woman from an inferior position in society by freeing her from the confined lifestyle necessitated by conventional dress” (Women in Pants, Catherine Smith and Cynthia Greig, pg 27). And truly, the female conventional costume of the time, with dangerously constricting corsets, very heavy petticoats, and floor length skirts “made it difficult for a woman to leave the home without the assistance of a man who could pick her up when she fainted… or help her into a coach” (12). Quite simply, in these clothes it was hard for a woman to physically function on her own. Not unlike the ladies in pants in Shakespeare’s plays, the women of dress reform and the women’s suffrage movement desired to literally stand on equal footing and, again, “leave the constraints of female propriety behind and argue equally.” So the bifurcated garment began to catch on. Slowly. Very slowly. 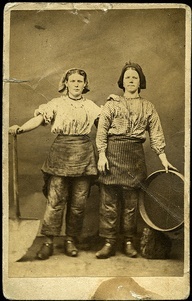 The sporting of trousers by real women began with female laborers: farmers, miners, ranchers, mountain climbers, travelers (see Rosalind, Julia, Imogen, Viola, Portia, et al) and sportswomen, and caught on even more for women during and after World War I. “Other women disguised themselves as men to secure higher paying jobs, to join the military, or to engage in a relationship with another woman” (7). And low and behold, actresses began playing men’s roles on stage!!! A direct flip-flop from the boys who played our heroines in Shakespeare’s time. By the 1880’s, when the famous Edwin Booth was touring in America, the shoe was indeed the other foot. It was a common practice for young women in the theater – soubrettes – to play young men’s roles! “And thus whirligig of time brings in its revenges” (Twelfth Night, V,1) . Well, perhaps, not revenges – more like equal opportunity trousers. 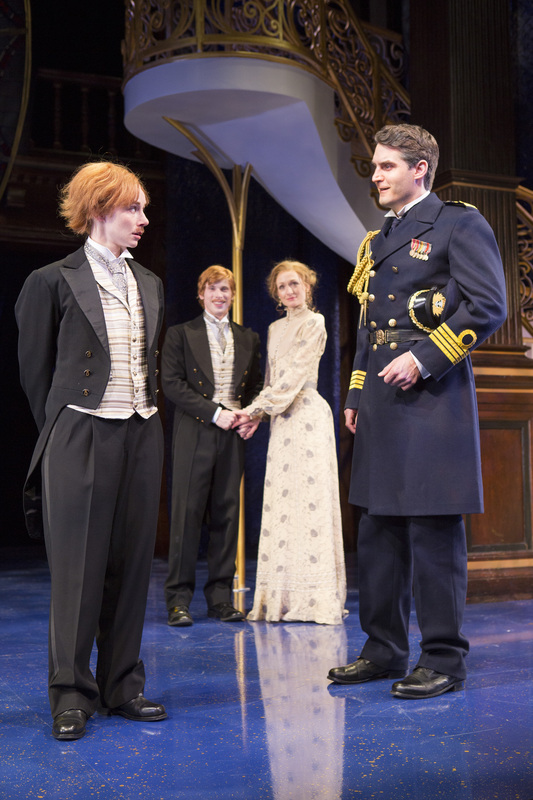 Viola’s (Emily Trask) identity is discovered by Duke Orsino (Michael Brusasco), much to the delight of Sebastian (William Vaughan) and Olivia (Rachel Pickup) watching from behind. Photo: Scott Suchman. As a side note – I had the great opportunity to work on the role of historical soubrette, Kitty Molony (a.k.a. Katherine Goodale), this spring in The Edwin Booth Company Presents, by Angela Iannone at The Player’s Club in New York. The Edwin Booth Company Presents is a wonderfully impressive piece about the comedies and complexities of Edwin Booth’s real-life touring company. It explores the historical inter-cast dynamics, the dark genius of Booth himself, and his more deeply complex and troubled relationship with his infamous brother – John Wilkes. Kitty Molony was a member of the company and while preparing to play her, I read her book Behind the Scenes with Edwin Booth which chronicles her experiences on tour. 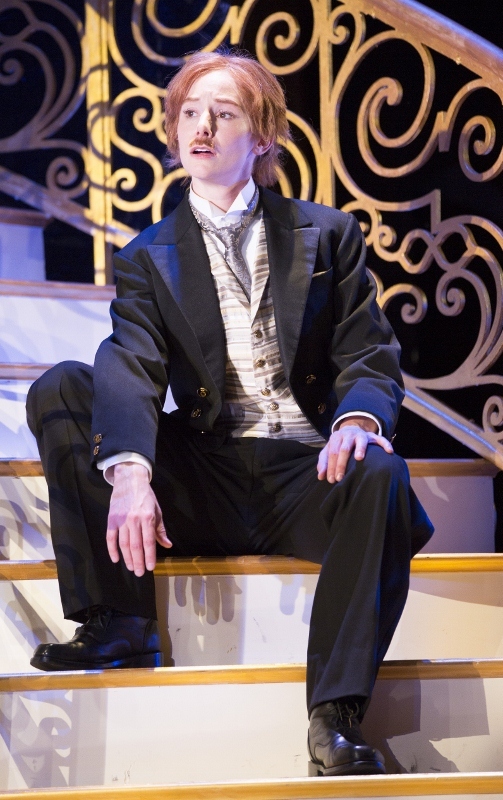 Molony played the roles of Jessica in Merchant of Venice (another young Shakespearean lady who dons pants – albeit very briefly – to run away from home) and Oseric in Hamlet, among others. I considered getting to “know” Kitty before coming to D.C to explore Illyria as Viola a stroke of illuminating luck! Both women were required to wear pants, on stage and in life, in similarly interesting ways. As it would happen, Booth, himself, disliked the tradition of women playing men’s parts since there were young men in the company capable of playing the roles that the young female soubrettes were taking. In the end, he politely asked Kitty if she would be willing to resign the role of Oseric for this very reason, and she agreed. It seemed only fair, as the same argument had been made for the would-be actresses whose roles were played by young men, not all that long ago. 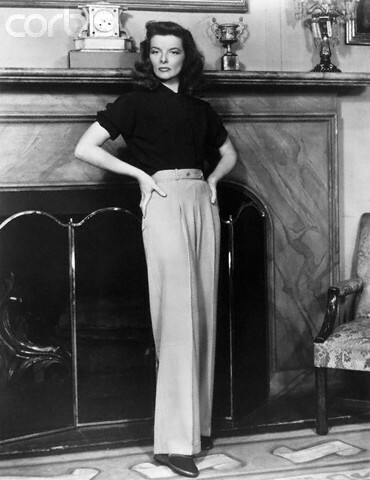 In time, actresses and icons like the beloved Katharine Hepburn, or the pedal pusher clad Audrey Hepburn, were instrumental in taking trousers from practical to more chic. And nowadays, pants are something most of us ladies take for granted and some of us even dread having to shop for. However, there is no denying that the decision to don pants was an extremely important step in the evolution of women’s role in society, and in finding their own voice. I would argue the same can be said for Shakespeare’s heroines who put on pants as well. who’s just trying to make his/her way in the world. Love the article. Thanks for sharing the information with us.